Have you ever had an experience where you were working on something at a particular time, partly due to a series of coincidences that “just happened” to make something convenient at that time, where that thing you were working on ended up feeling “just right” for that moment? I had one a couple of weekends ago that was probably the closest I’ve come to that to date. Back in April of 2006 I did a mail-in audition for a reality TV show called “Rock Star 2”. I didn’t get anywhere with the audition, but one requirement of the audition package was a recording of a well-known cover song of your choice in a rock style. I hadn’t recorded anything that fit the bill at that point, so I chose Bob Dylan’s classic “Blowin’ in the Wind”, and dressed that up in a fairly modern rock style, complete with an original instrumental hook and a modulated instrumental solo section. I really liked the arrangement and recording, but, since nothing came of the audition, and I didn’t have another outlet for the recording at the time, the recording just sat on the shelf. It sat there for over a decade, though I’d listen to it from time to time. Cut to early August of 2016, which was about a month after finishing my pop album, In and Out of Love Again, and I was considering what would be next on the recording front. I’d been thinking about a rock album, but I decided not to commit to a project as big as an album, but rather to put out some singles, choosing each one as I finished the one before. In the last quarter (plus one day) of 2016, I released three singles, all of which were remixes of original songs I’d written 5-6 years earlier. At some point late in 2016, CD Baby came up with a new program for licensing cover songs that appeared to dramatically simplify dealing with that licensing for songs distributed through them. (They are my distributor for most outlets, including iTunes, Amazon MP3, Spotify, and more.) I’d avoided putting out cover songs to that point due to some licensing complexities, and, to a lesser degree, cost considerations. 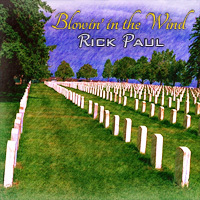 However, this new program sounded like it could make things relatively painless, so I started considering the few cover songs I’d recorded, and “Blowin’ in the Wind” immediately came to mind. After finishing my most recent single early in December, I decided I wanted to try something different, and I came up with several ideas for possible near-term singles, none of which were songs I’d written. I started working on “Blowin’ in the Wind” in late December, with the idea of making it the first. The recording I’d made back in 2006 was not up to snuff for my current production standards — I mean we’re talking about 10+ years ago — so I started working on a remix. I finished a final mix the evening of Wednesday, January 18, 2017, with its passing a car listening test the next day. Thursday night I started on the cover art for a digital single, and I finished that Friday night, January 20th. On Saturday morning, January 21st, when I turned my phone on and did a very quick look at Facebook, the first post I saw was one of my closest local friends posting some photos of her and some friends going up to the Women’s March in Los Angeles. Throughout the course of that day, I saw many posts of the hundreds of thousands of protesters at similar marches in other cities. I’ve always thought of “Blowin’ in the Wind” as a protest song, and it’s obviously got some lines in it about groups of people who are marginalized in some way. I think the only way the timing could have felt “more right” on this recording would have been if it had actually coming out that day instead of a little under a week later.